What happened to the Renault engine? I don't understand how Ferrari and Mercedes can be so slow. Hamilton has #5 wrapped up if FP2 is a true reflection of the pecking order barring an absolute miracle drive from Vettel. Interesting FP2 (and I assume FP1, but I missed that so can't comment much). Do we see Merc/Ferrari getting close to Red Bull at all tomorrow? Can Renault qualify in the top six? Just a bit tricky to know how much to read into today's times from Merc and Ferrari. I expect Red Bull to lock out the front row but after that I'm struggling to call it at this point. Does the Red Bull have so much more downforce than Merc/Ferrari to give that much of an advantage when they aren't disadvantaged by the PU? What on earth is going on here? Can't wait for the qualy tomorrow. In recent times I had written off Max becoming the youngest pole sitter because the Red Bull wasn't up to the task. Unless Merc or Ferrari step up in some significant way it looks like young Max might possibly get the record this weekend. Edit: Also with the Hypersofts only going 13 laps in practice, the choice of Renault and Sauber to take 10 sets of Hypers looks more and more dubious. Am thinking that the prefered strategy will be to used Supersofts in Q2 tomorrow and Hypers in Q3 to set fast time. (At least for those who realistically have a decent shot of getting into Q3. The altitude has closed the gap in power units I guess. Max will never have a better chance to break that record, that's for sure. Of course the Ferraris and Mercedes will have another gear in Q3 so it might not happen but it looks like Red Bull might be the car to beat on Sunday. Lewis was only 0.146 sec. adrift of Sebastian in FP2, and had him covered in FP1 by 0.671 sec. Still a lot of sorting out to do. Sebastian has not shown that he can dominate at all this weekend like he needs to. I am also wondering about the rate that teams are using up their Hypersofts. The Hypers are only lasting about 13 laps in practice and that seems to make them poor candidates for the race. Guessing that the prefered strategy will be to start on the Ultrasofts and then go to Supersofts. Have the teams made a mistake by choosing so many hypersofts ? Well, Quali looks like it will happen in the rain. Increasing chance of rain as the race goes on Sunday. They may not have to rely as much on the hypersofts. Rain or no rain, teams will be wary using Hypers in Q2. Starting on them in the race is a big sacrifice to track position (as we saw in Singapore), those who qualified from 7th to 10th on hypers, got screwed big time. Check the link below for race pace & weather update. Read a blog where the blogger stated last night it rained real hard. The track will be green again due to the washed rubber, rendering the hypers useless! 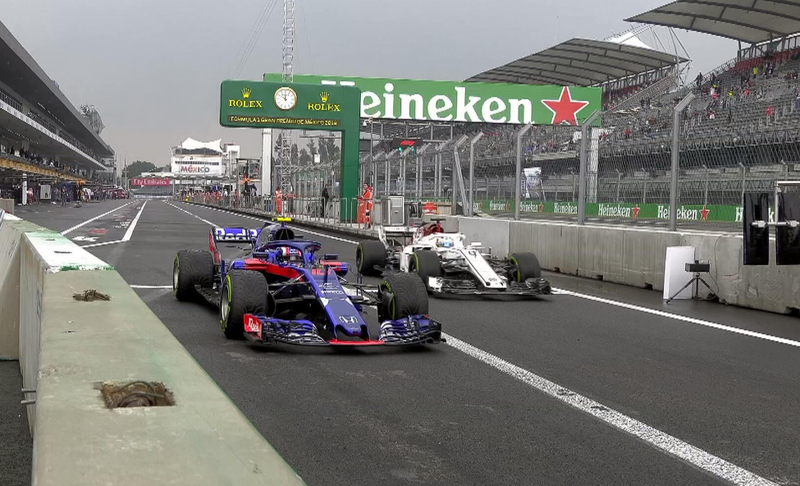 If it's not wet I wonder if even the midfield teams will use the ultrasofts in Q2 given the massive disadvantage of starting the race on the hypersofts? The problem is that nobody ordered less than 8 sets of the hypers out of the allotted 13 sets and Renault and Sauber took a full 10 of 13 sets of the hypers. Renault and Sauber only have three sets of tires that are Supersofts or Ultrasofts for each driver. We have FP3, Q1, Q2, Q3, and the race to go yet. The probable need to use wet tires in Quali will help with the tire situation but still a lot of teams have a lot of Hypers that are not very useful. Well I guess hypers in Q1, one set of ultras in Q2, and then hypers in Q3 if you make it that far, there might need to be a certain level of sacrificing qualifying for the race itself? Yeah, that is the best strategy that I can come up with. Still what Weather Underground is saying for Mexico City, is 72% chance of rain at 2:00 local time going up to 84% at 3:00. If so the starting grid could be a real jumble on Sunday. Sunday's forecast is for about 25% chance of rain during the race. Yesterday's FP1 & 2 sessions were quite bizarre! Renault out of all he teams showed the most promise / power. The Hypers got a lot of criticism yesterday. I wonder which is a worse tyre - Hypersoft or the blue walled Superhard tyre! Good. I bet the inters have more grip than hypers. If all use inters during qualy, no one will touch hypers & just use ultras & supersofts! The track is currently damp & more rain is expected! Just tuned in to FP3, what the frax? Why isn't anyone running? Bottas's car stopped - Hydraulic failure! Yes, should be a good qualy! Can't wait to crown the King. Ericsson very often seems good here. I think he has a good chance of out qualifying Leclerc today. Mad Max out for blood. Looks mega tight between the #1 drivers. Good stuff from Max but Mercedes and Ferrari might have more beans for the 2nd Q3 run. It's something Ferrari have repeatedly done through 2017 and 2018. It might not matter enough on this circuit though. Can't wait for the 2nd runs. Max strangely didn’t set any purple sectors but still provisional pole. Ferrari monstrous on the straights gaining 0.6 seconds on RBR on them.